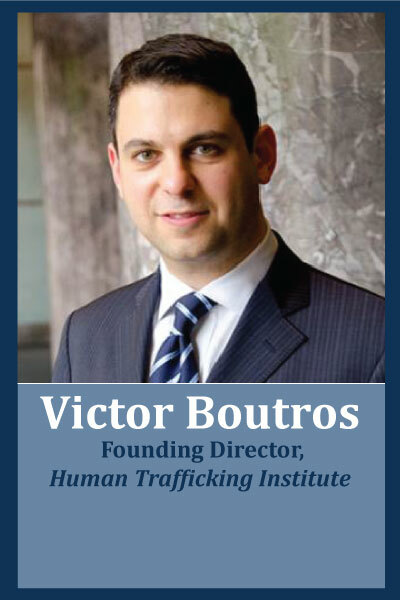 Victor Boutros previously served as a federal prosecutor in the Justice Department’s Human Trafficking Prosecution Unit and trained law enforcement from different parts of the world on how to investigate and prosecute human trafficking. Boutros is the Founding Director of the Human Trafficking Institute and the co-author with Gary Haugen of The Locust Effect: Why the End of Poverty Requires the End of Violence (Oxford Press). Drawing on real-world cases and extensive scholarship, The Locust Effect paints a vivid portrait of the way fractured criminal justice systems in developing countries have spawned a hidden epidemic of modern-day slavery and everyday violence that is undermining vital investments in poverty alleviation, public health, and human rights. A critically acclaimed work of thought-leadership, The Locust Effect is a Washington Post bestseller that has been featured by the New York Times, The Economist, NPR, the Today Show, Forbes, TED, and the BBC, among others. Click Here for more information on Victor.